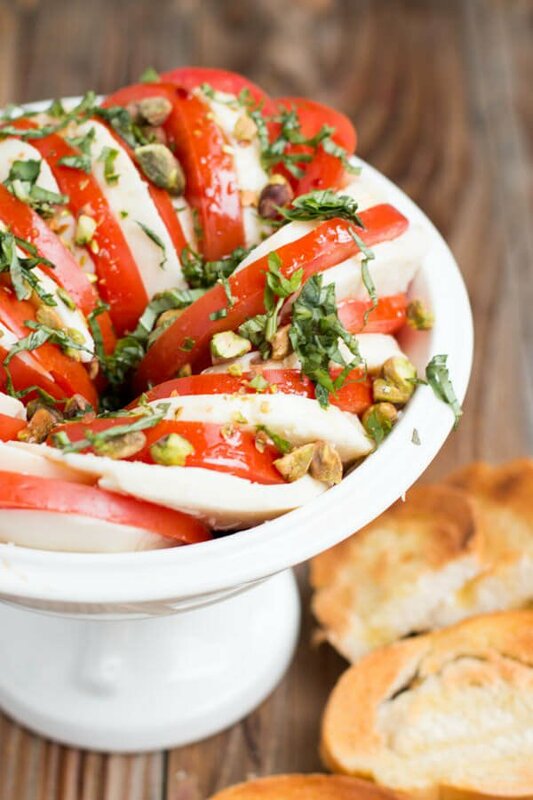 The BEST caprese salad with pistachios recipe is right here! There’s nothing like finding a good recipe for fresh from the garden tomatoes. 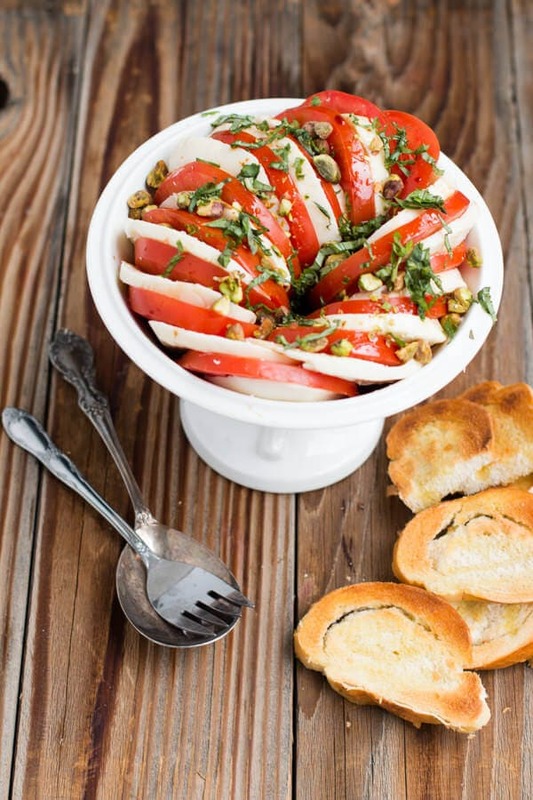 Have I ever told you we love caprese salad? No? Well, we do. Like, a lot. Especially when it has a really nice balsamic vinegar (not the cheapest no name at the store). 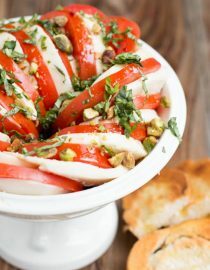 And even more so when it’s the best caprese salad with pistachios. Oh my good golly it’s good!!! We’ve told you about our love for our 4 cheese margarita pizza and our caprese style tomato soup that has those mozzarella mini grilled cheese bites (but seriously, it’s the best tomato soup in all the land, trust me), but this caprese salad is so light and refreshing and oooooooooohhhhhhhh so wonderful during the summer when you can pick the tomatoes straight from your garden. I had no idea tomatoes could even be that delicious until I tried my first homegrown tomato. It’s like a totally different thing. Am I right, gardeners?! Anyway, we love pistachios and threw some on top of this pretty salad one night and we both found ourselves digging for the pistachios which could only mean one thing, they were meant to be. It was especially good with the crusty bread PLUS doesn’t it look so pretty? I love bringing a pretty but totally scrumptious dish to a party. Trust me, everyone will be so impressed and you don’t even have to tell them it’s just sliced food, drizzled with olive oil, balsamic vinegar, chopped pistachios, basil and a little salt and pepper. Let’s pretend you really slaved away instead. 🙂 And really, the secret is in the good quality of balsamic vinegar. Trust me. Pistachios are small nuts that contain protein, fiber and a wealth of vitamins and minerals. A serving of pistachios contain 3 grams of fiber, 6 grams of protein, and 11 grams of heart-healthy fat. 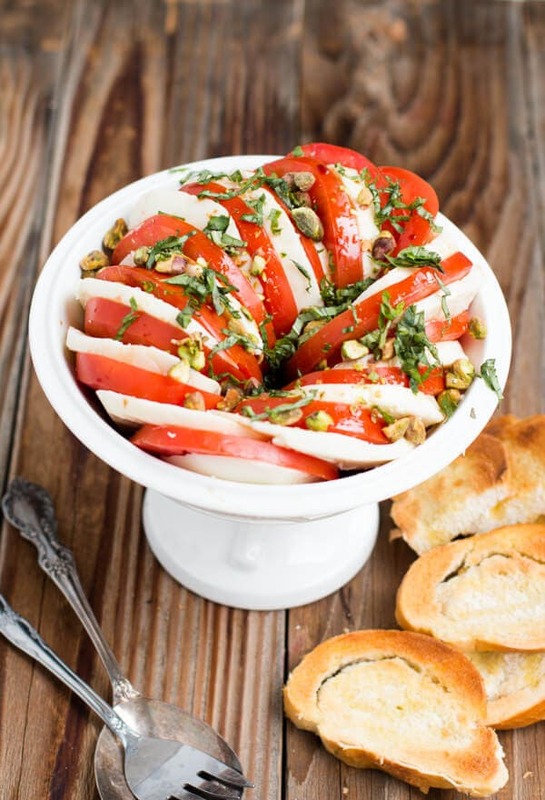 Caprese salad is a simple Italian salad, made of sliced fresh mozzarella, tomatoes, and sweet basil, seasoned with salt and olive oil. Tomatoes are a great source of vitamin C, potassium, folate and vitamin K.
One medium sized tomato contains only 22 calories. 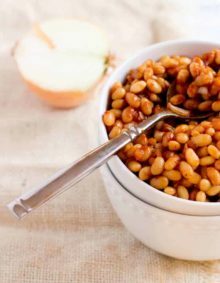 Tomatoes are also high in fiber. 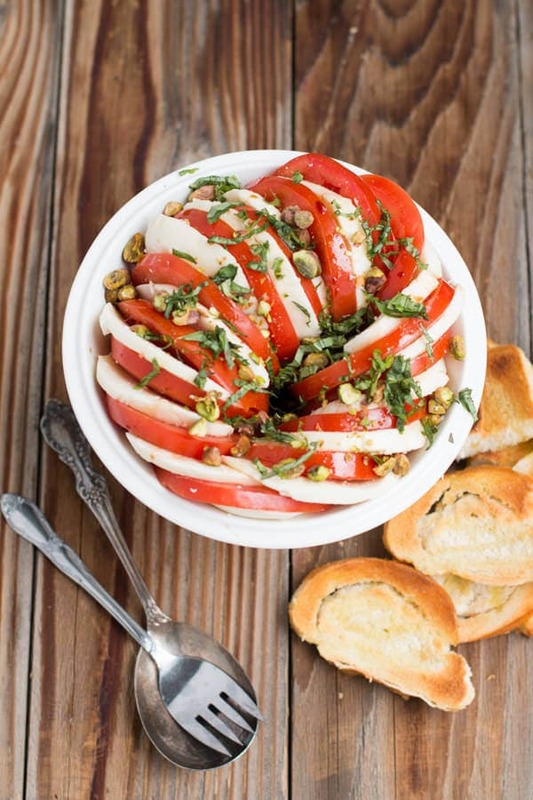 Slice the tomatoes and mozzarella and arrange in a spiral in a dish or bowl. 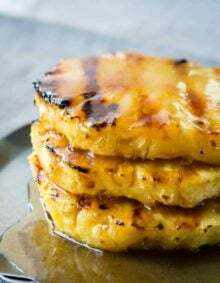 Drizzle with olive oil, balsamic vinegar and a sprinkle of salt and pepper. Top with pistachios and basil and serve immediately. If you wish to make the salad ahead just arrange the tomatoes and cheese and cover with plastic wrap in the fridge. Chop the pistachios and set aside. When you’re ready to serve, dress the salad and add fresh basil. 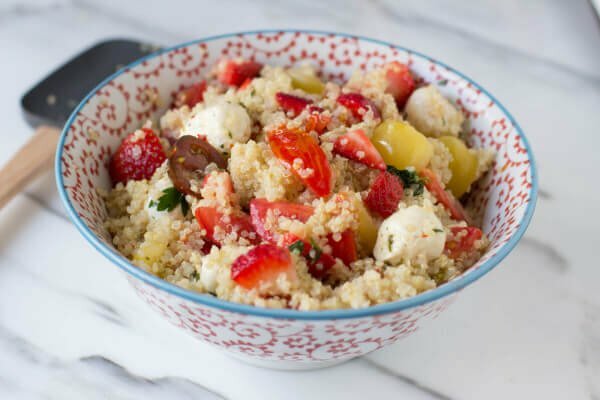 Just cook up some quinoa, add tomatoes, cheese and berries and dig in! 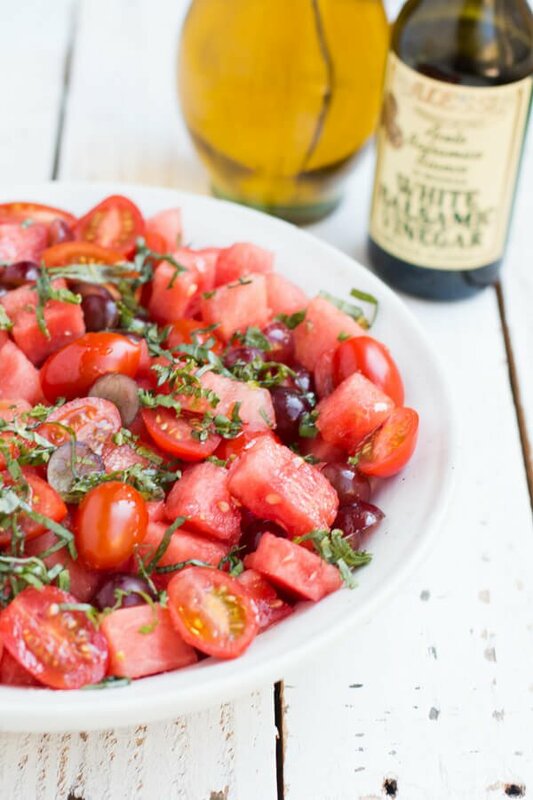 Have you ever had a fresh, bright watermelon salad with mint? It is wonderful! 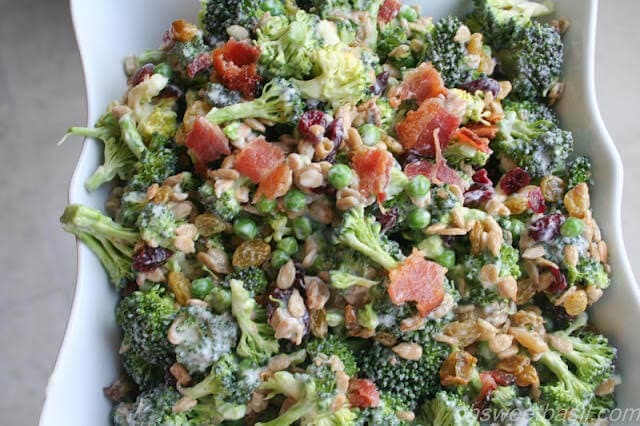 Oh how we love this broccoli salad! Wow! Whether plated so beautifully, as per Carrian…or rustically thrown together (that’s me), this truly is “the best” Caprese EVER. I ended up using heirloom tomatoes, and my only other tweak is that I reduced the balsamic vinegar to a semi syrupy consistency. It actually tastes sweet and luxurious in its viscosity. Shhh., don’t tell anyone, but next time I’m going to use Burrata! 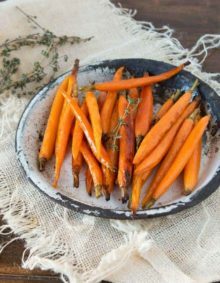 Thank you Carrian…you’ve turned a classic and easy recipe into something that is still easy, but for our little family of 2, you have redefined the word classic when it comes to what you’ve shared. The Pistachios?…Brilliant. Thanks so much Jeff! We love to make it with burrata and heirlooms as well! I don’t know why those two ingredients make everyone so nervous but they are our favorites! I’m definitely going to try it with pistachios next time. Great idea. What a beautiful salad and I love that you added pistachios!